Experience the sights, sounds, and tastes of the North of Spain and Portugal on this 12 day tour. Departing from and ending in Madrid, this trip features sightseeing tours of the Tower of Belem and Monastery of Los Jeronimos, a visit to the Plaza del Obradoiro (pictured to the left), and a chance to soak up the splendor of La Toja Island, ria de Arosa, and Pontevedra. Personalize your trip with optional excursions to Sintra, Cascais, and Estoril. Savory breakfasts and delectable dinners are included throughout the tour. 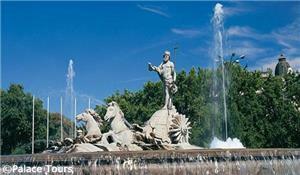 Depart from our bus terminal in Madrid at 8:00 AM for a short stop Zaragoza. After visiting Zaragoza, continue on to San Sebastian where you will have a delicious dinner of local cuisine and stay the night in a 4 star hotel. Enjoy breakfast before departing for for the city of Bilbao, where you will have a short panoramic tour to admire the Guggenheim museum. After the tour, continue on to Santander for free time to explore the city. In the afternoon, you will travel to Santillana del Mar - considered a national monument. After a short stop, you will end the day in Torrelavega where you will have dinner and stay in a 4 star hotel. Have breakfast before departing through the Picos de Europa mountains by splendid landscapes. Arrive in Covadonga and enjoy free time to visit the shrine. Later, continue on to Oviedo where you will have dinner and stay the night in 4 star accommodations. After breakfast, depart for Gijon - the second capital of the Asturias region. Have a short panoramic tour of the area before continuing through Luarca, Ribadeo and Lugo in Galicia. Have a dinner of the local cuisine and stay the night in Lugo. Have breakfast before heading to La Coruna for a short panoramic tour. In the afternoon there will be an optional excursion to the Rias Altas through typical villages such as Pontedueme and Betanzos. 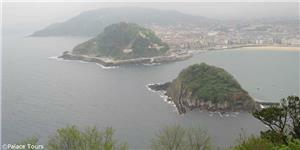 You will have dinner in La Coruna, as well as stay the night in 4 star accommodations there. Enjoy breakfast before departing for Santiago de Compostela where you will have a city tour of the legendary pilgrimage town. Visit the Plaza del Obradoiro, the famous Cathedral and ending point of the way of Saint James and more. Have the afternoon at your own leisure to taste the local cuisine, do some shopping or explore more of the area. You will have dinner and stay the night in Santiago de Compostela. After breakfast, journey through the splendid landscapes of La Toja Island, ria de Arosa and Pontevedra to the area of Spanish Fjords (Rias Bajas). There will be an optional excursion to Santa Tecla and Valenca de Mino across the Portuguese border. Later, continue on to Vigo where you will have dinner and stay the night in 4 star accommodations. Enjoy breakfast before heading to Castilla-Leon via Zamora region. Arrive in the monumental city of Salamanca where you will have free time to visit the old quarters and the famous Plaza Mayor. You will have dinner in Salamanca and stay the night in a 4 star hotel there. In the morning depart to Ciudad Rodrigo and the Portuguese border. Continue via Guarda towards Coimbra - the site of one of the oldest universities in Europe and birthplace to Fado (the music of Portugal). You will have dinner and stay the night in luxury accommodations in Coimbra. After breakfast, depart for Fatima where you will have free time to visit the shrine. Continue on to Lisbon, the capital of Portugal, located at the mouth of the river Tagus. There will be an optional night tour to attend a traditional show of Fado songs and music. You will stay the night in Lisbon. Enjoy breakfast before a morning tour of Lisbon. Visit the old Alfama Quarter, Tower of Belem, Monastery of Los Jeronimos and more. Have the afternoon at leisure. There will be an optional tour to Sintra, Cascais, and Estoril. After breakfast, depart for Caceres where you will have free time to visit the Plaza Mayor, the old city and its famous Medieval quarter - considered a World Heritage Site. Have lunch on your own before continuing on to your final destination of Madrid.